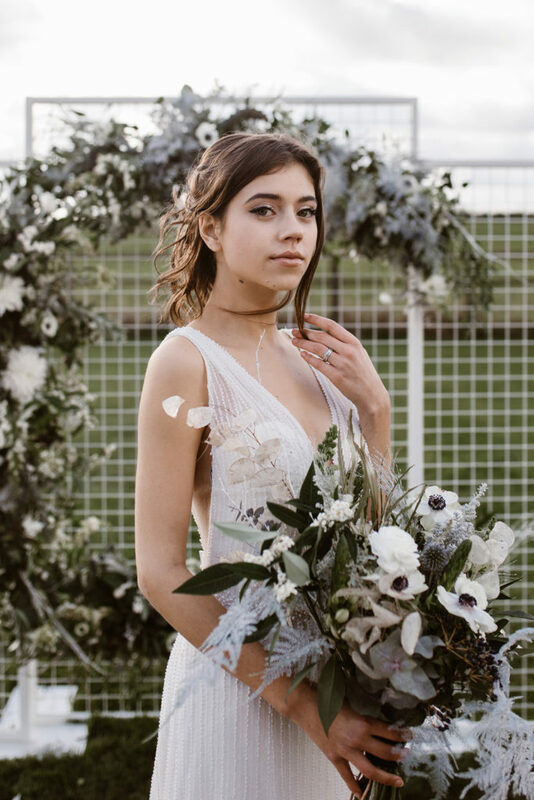 Images by The Wild Bride & Agnes Black. 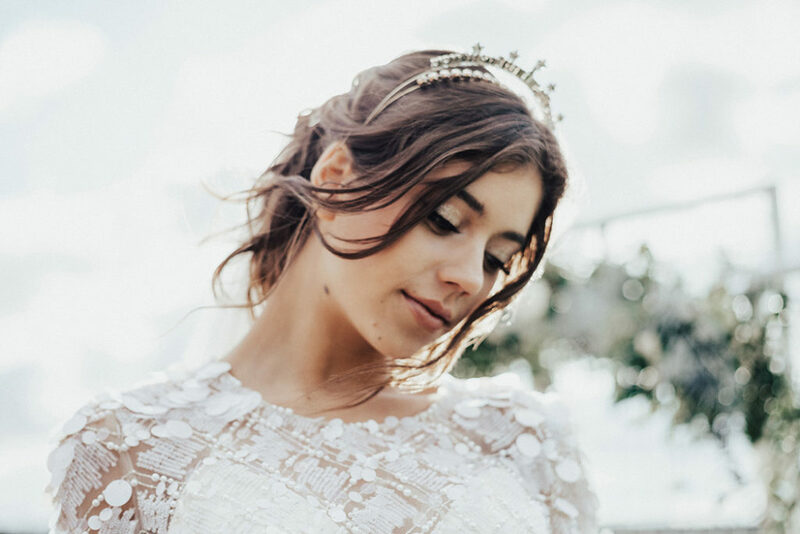 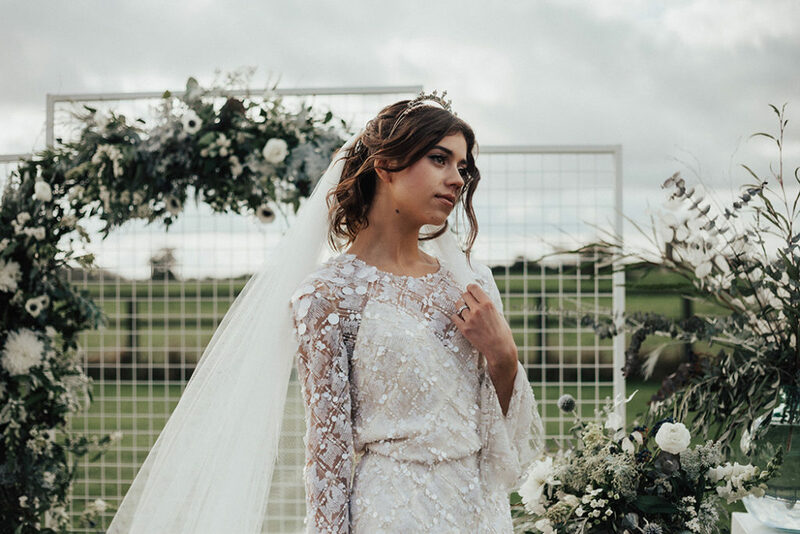 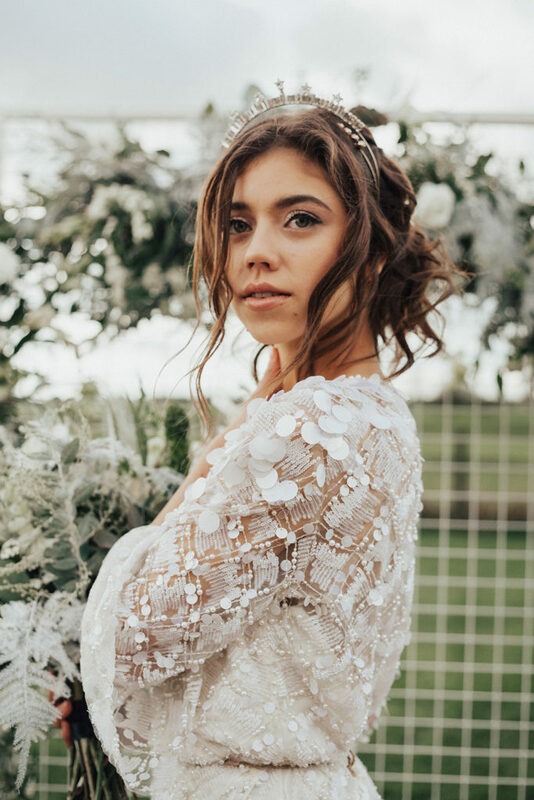 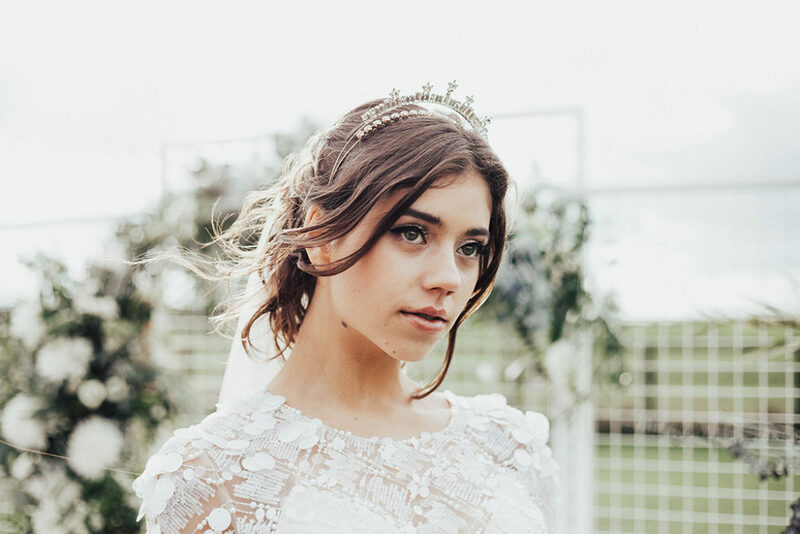 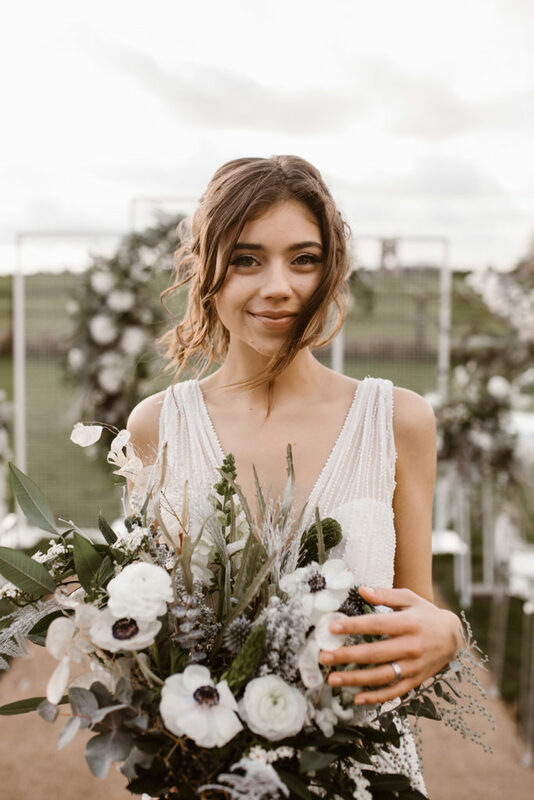 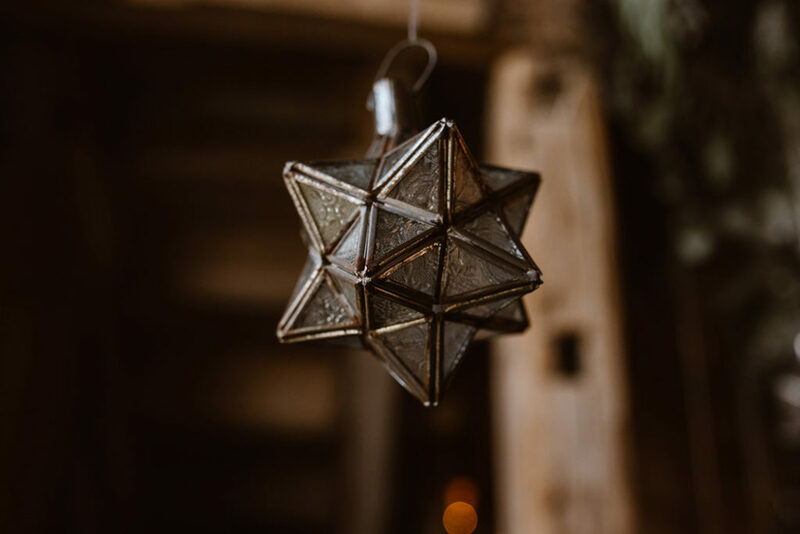 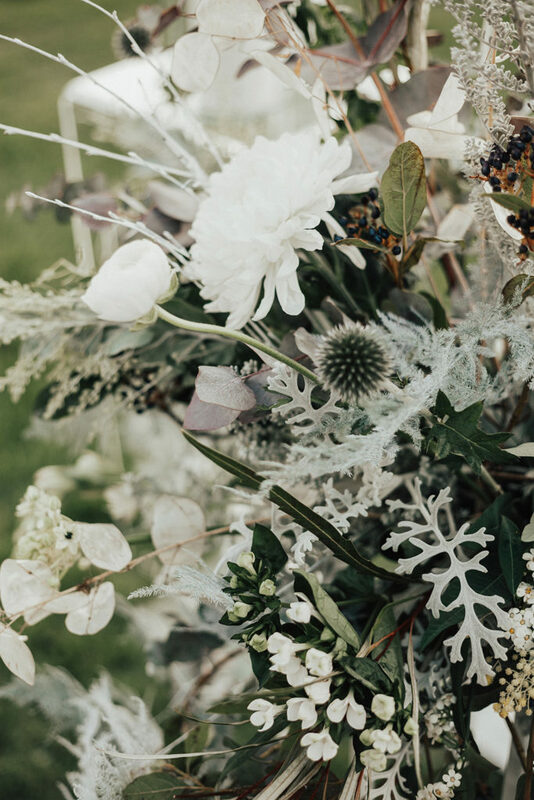 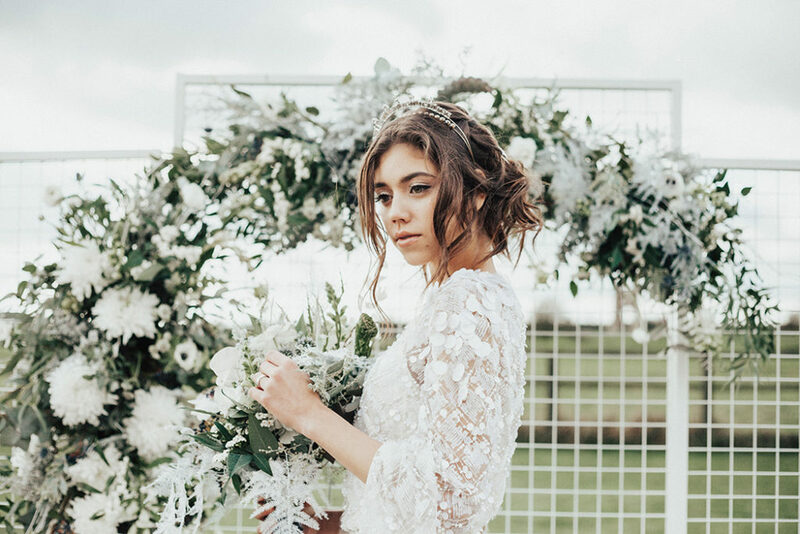 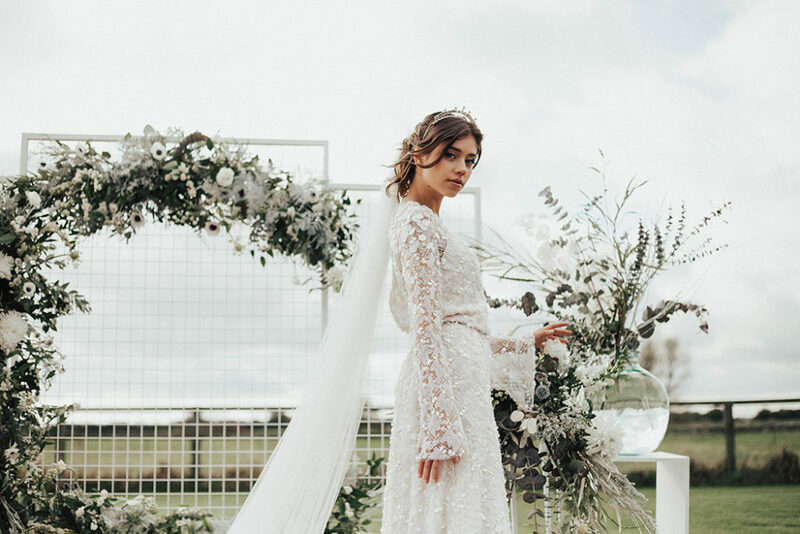 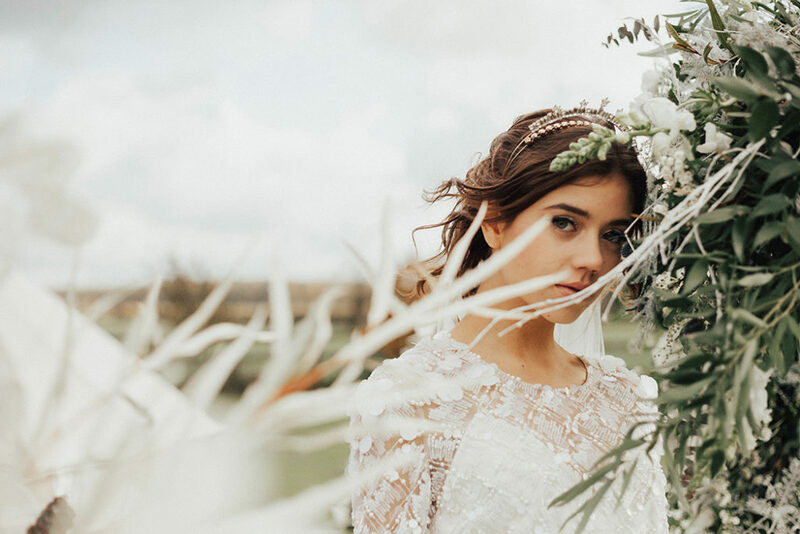 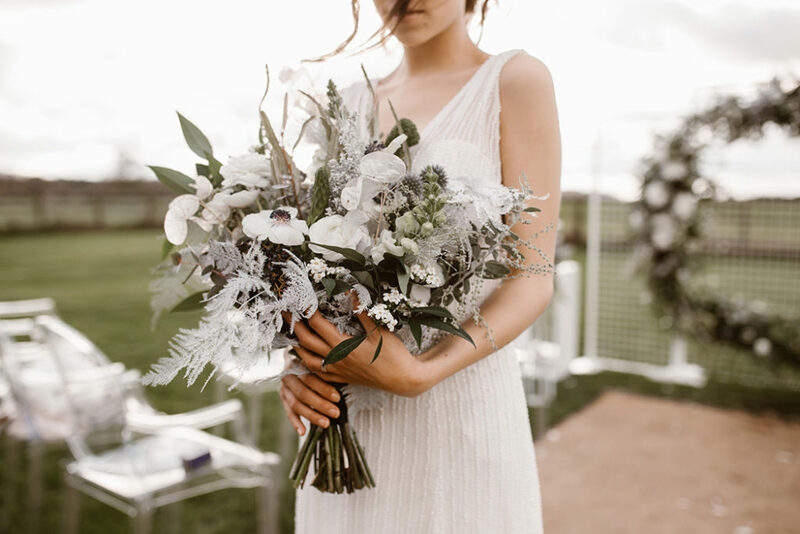 Taking inspiration from the night sky, a canopy of sparkling stars and soft moonlight before the dawn, this shoot was a collaboration from Most Unusual Wedding Fair suppliers curated by stylist Penny of The Little Lending Company. 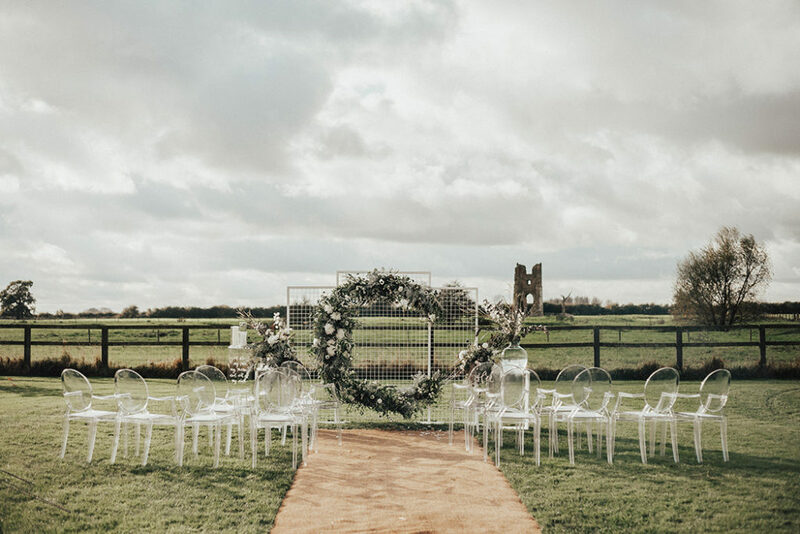 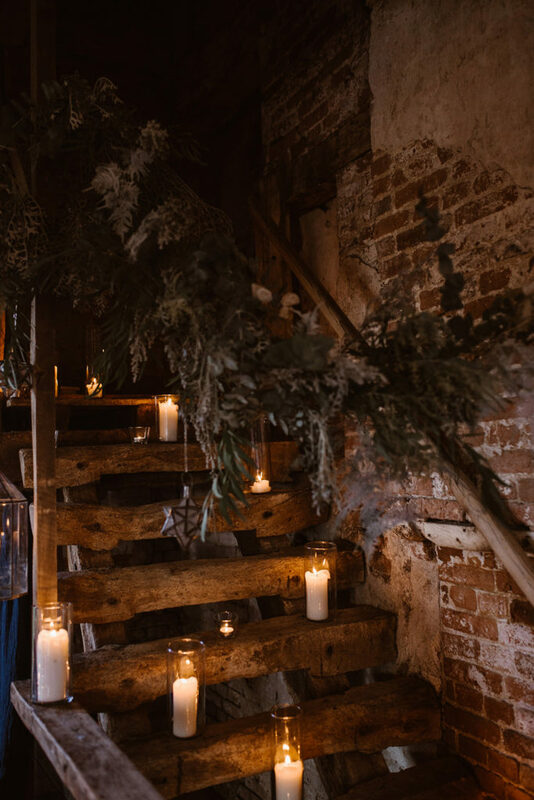 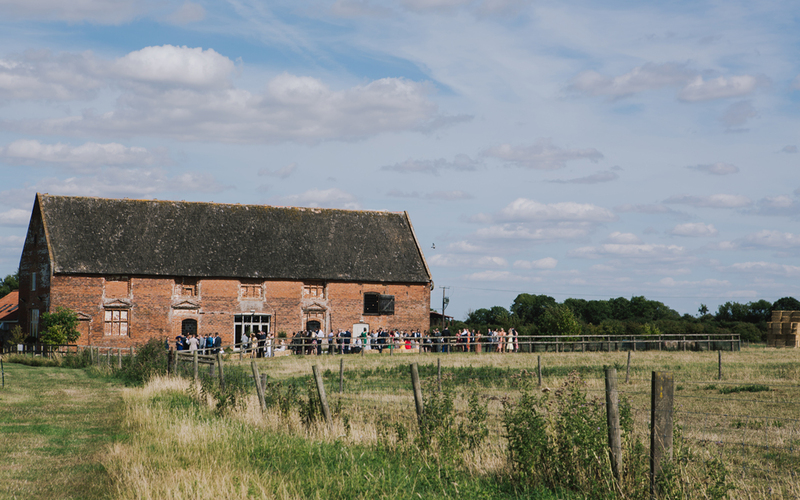 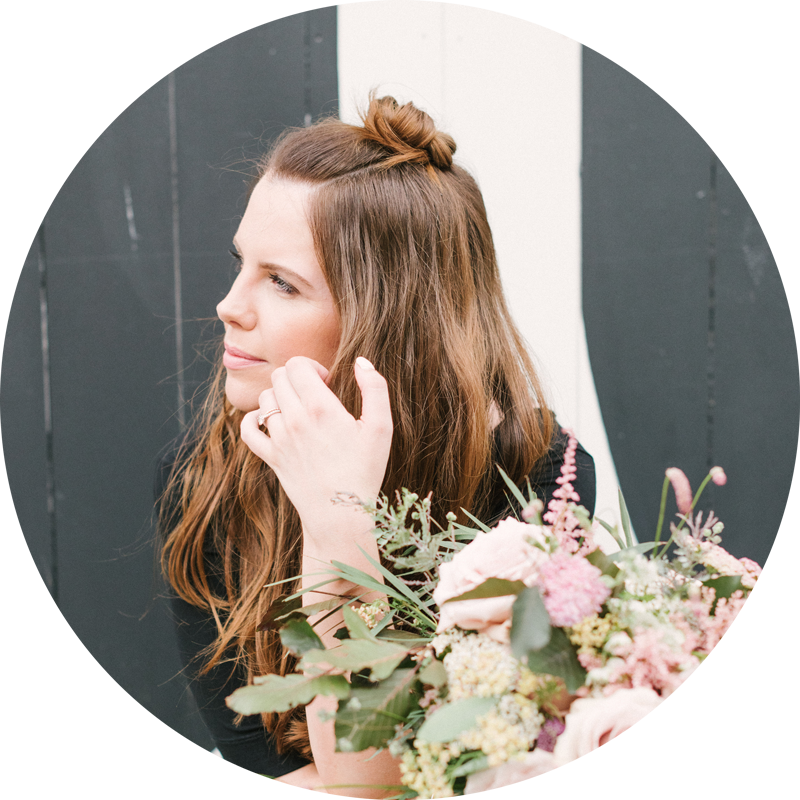 We heard from Penny on Monday when she talked us through what you can expect at this weekend’s Most Unusual Wedding Fair at Godwick Great Barn in Norfolk, so today to keep those excitement levels up we’re showing you the inspiration and talent from #TMUWF17! 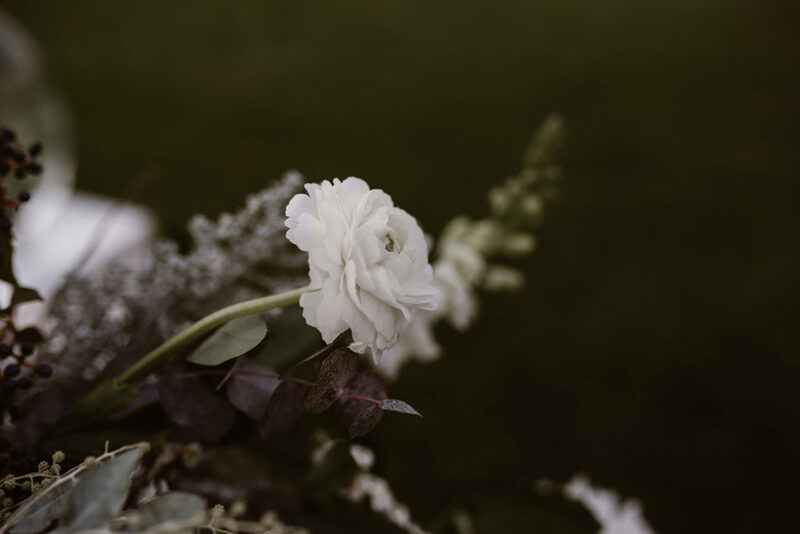 Notes from The Little Lending Co. 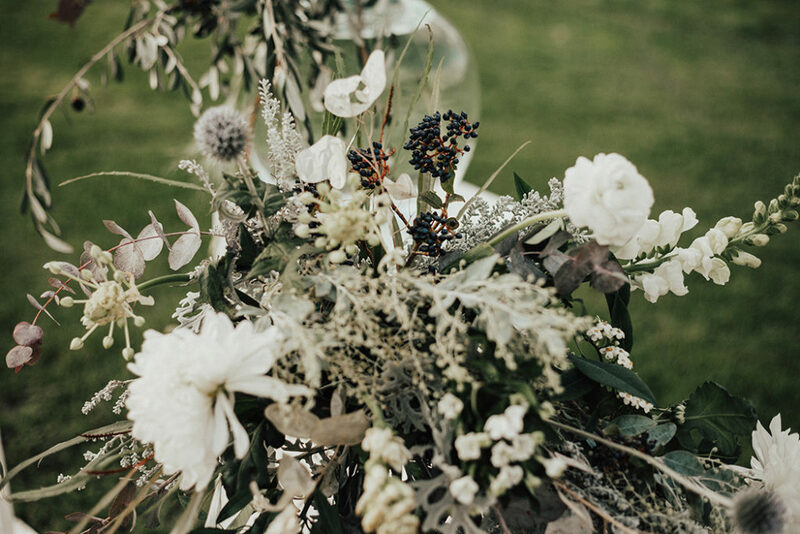 Think inky, ethereal, other worldly, moody and magical for this offering. 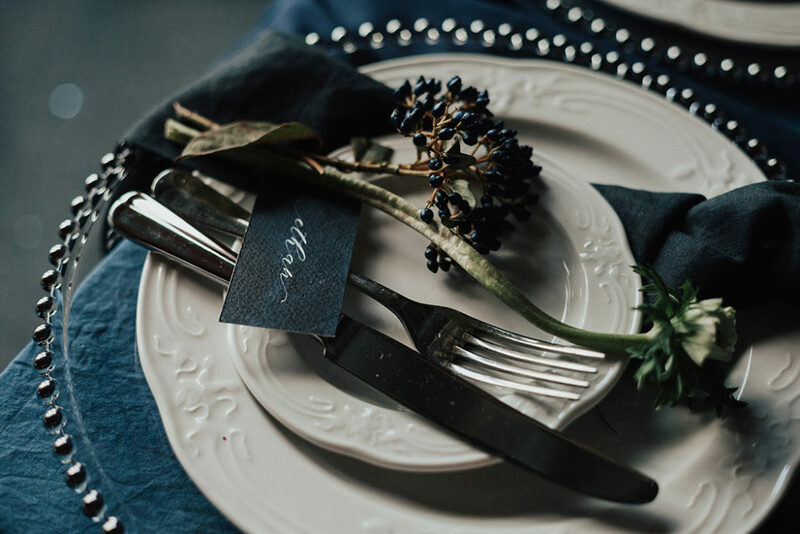 With a palette of ink navy, iridescent blue, tonal whites and metallic highlights of pewter and tarnished silver making up the décor. 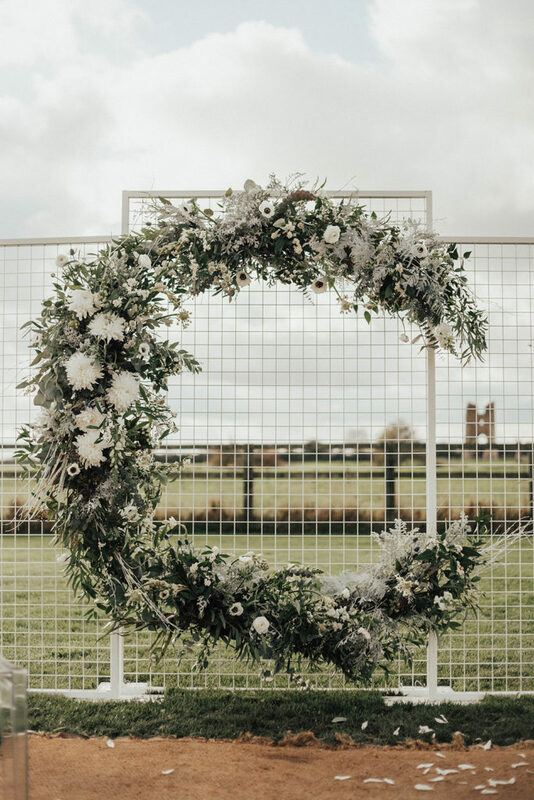 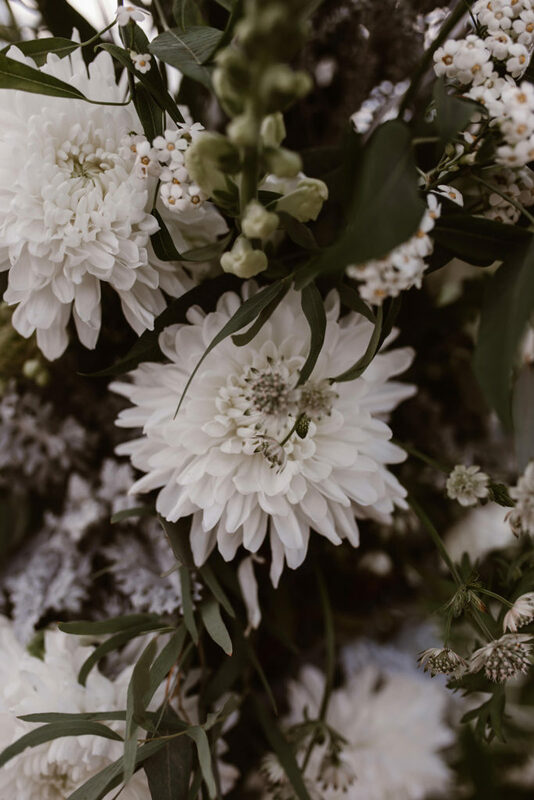 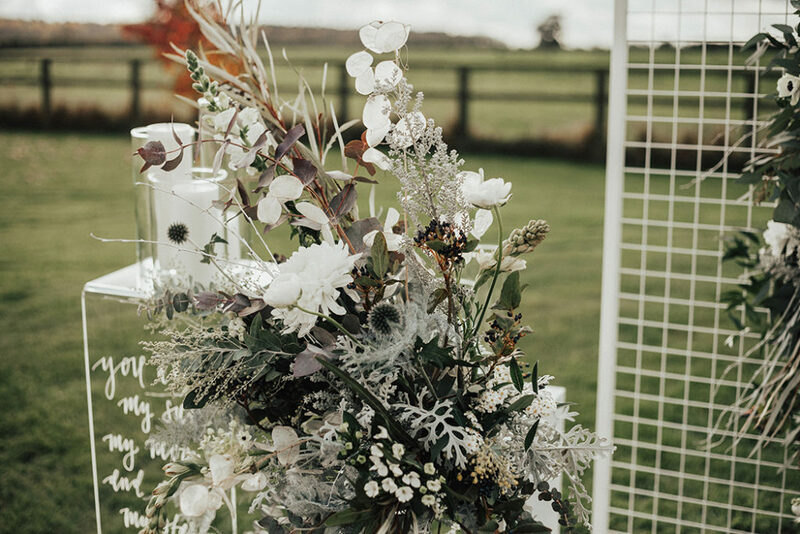 The showstopper ceremony focal point of a cresent moon placed on a 3 panel grid frame, was created by the Swaffham Florist using a mix of white anemones, lisianthus, astrantia and astilbe with greens from asparagus fern sprayed white, seneccio, silver mimosa and eucalyptus. 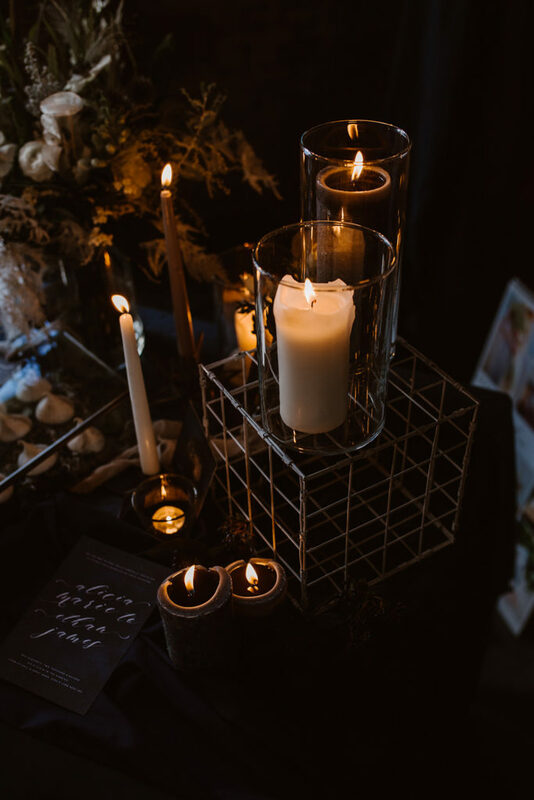 Next to the frames stood white painted plinths with more loose arrangements in large glass vessels paired with simple candle cylinders and perspex plinths with “You are my sun, my moon, and all my stars” by E.E Cummings. 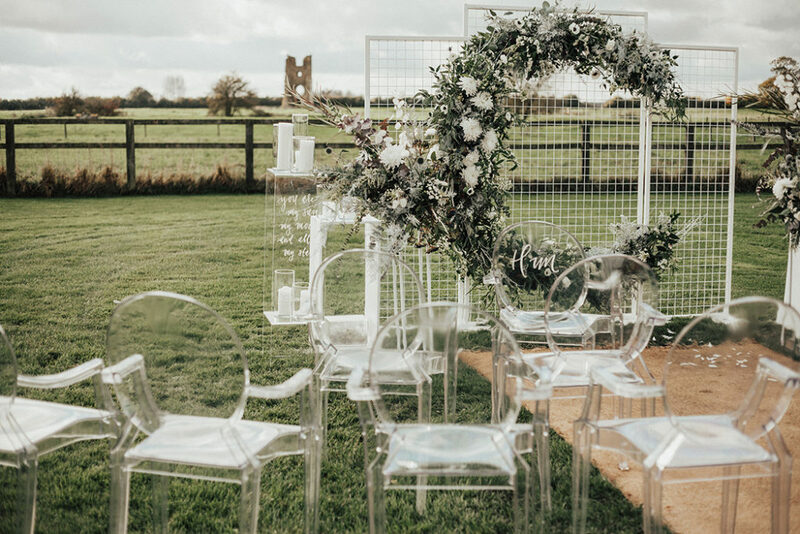 Transparency was carried through with the ghost chairs which just made the setting of Godwick Hall even more majestic. 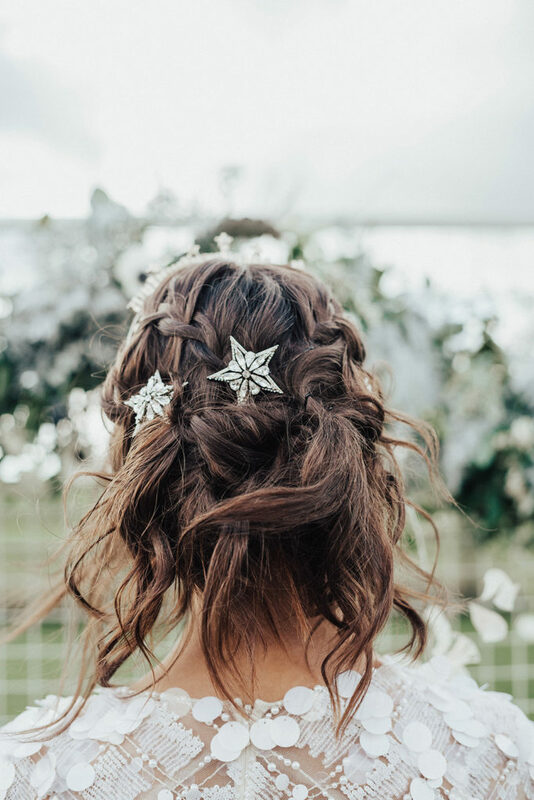 The models hair by Flamingo Amy was unstructured and organic in texture and adorned with Tilly Thomas Lux jewels – the Jazza star hair clips and Celestia headband added a little dazzle and soft sparkle to the look. 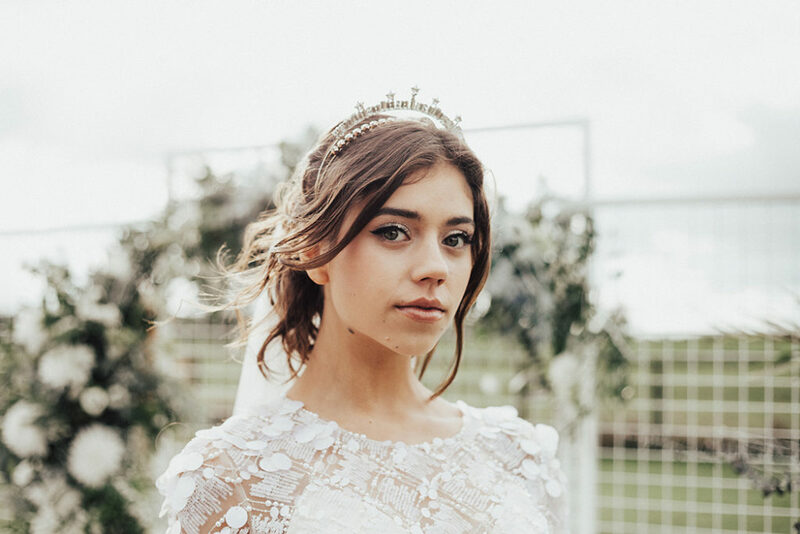 Makeup was shimmery and soft by Love Moi Make-up. 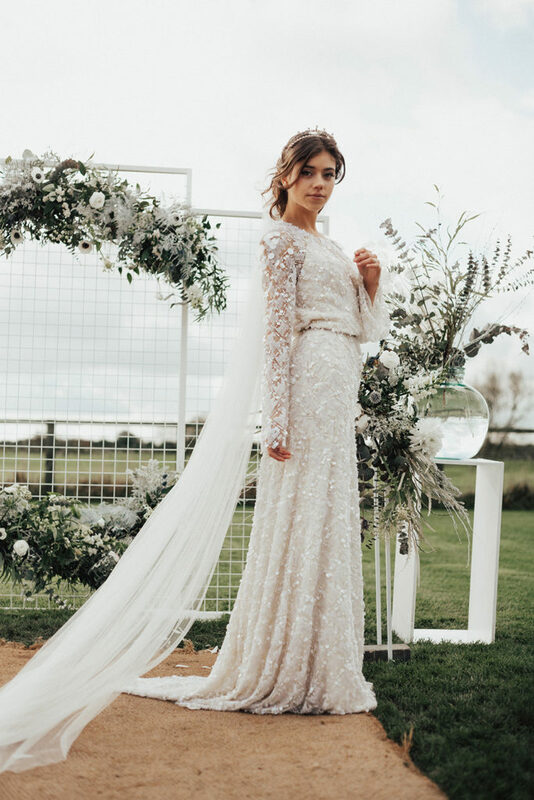 Lily, our model, wore a fully embellished bell sleeve gown by Jenny Packham available at House of Snow. 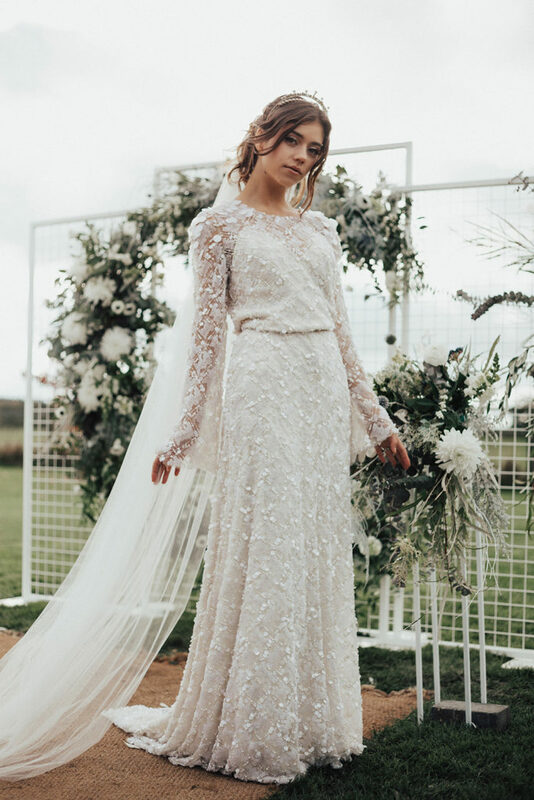 The second dress was Watters Woo with sheer top and white beaded overlay. 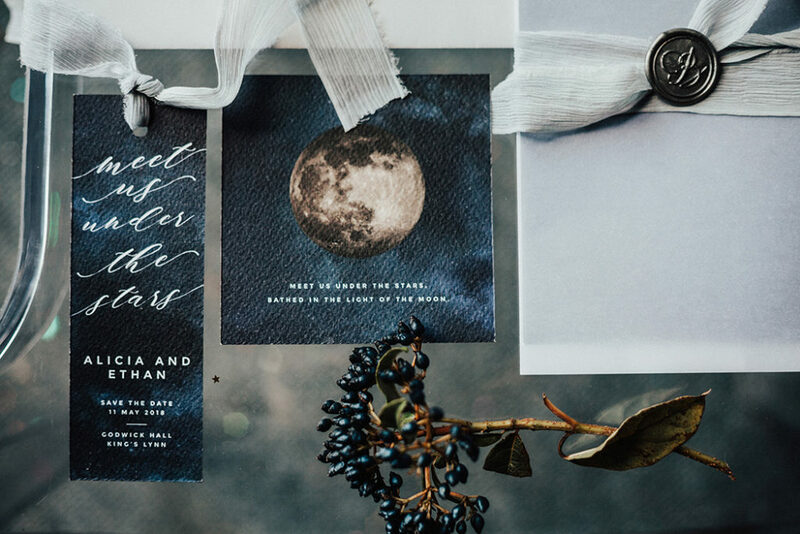 A midnight blue Maids to Measure dress from The Bottom Drawer Bridal hung in the center of the moon cresent, ideal for maids who’d like to go a little darker. 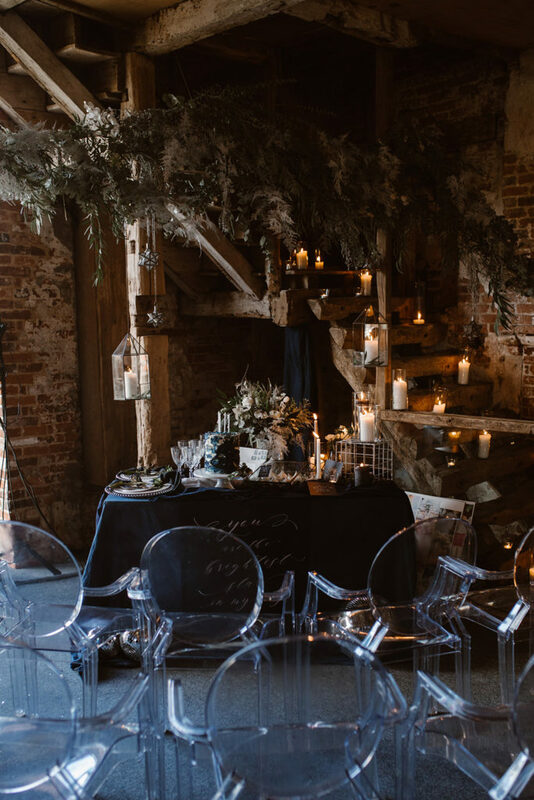 Inside was the contrasting look of the deep, dark and inky blues. 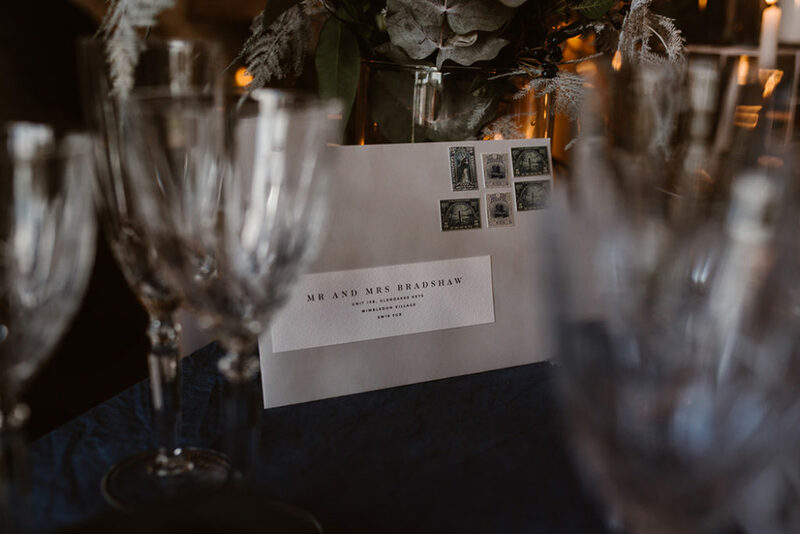 Using a hand-dyed navy linen as a base for the tablescape there were silver beaded charger plates from Banqueting Hire with cut glasses, ornate silver cutlery and an abundance of candlelight and candlesticks in glass holders. 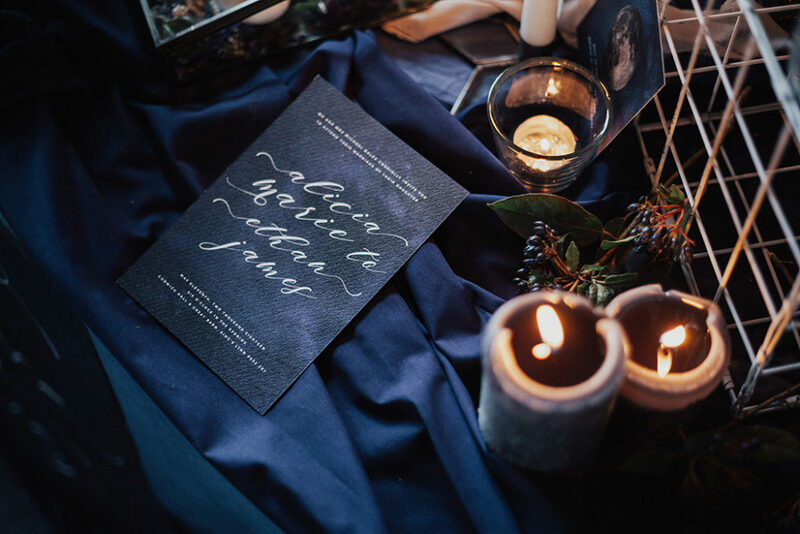 Papelle London provided a beautiful printed quote banner and stationery suites for the table. 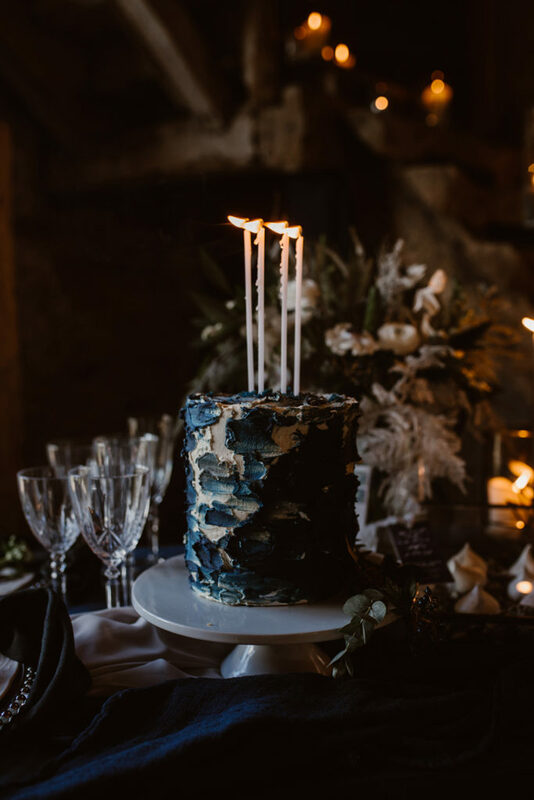 The cake by Buns of Fun Bakery was a blue velvet sponge, layered with silky whipped cream cheese frosting providing contrasts once sliced. 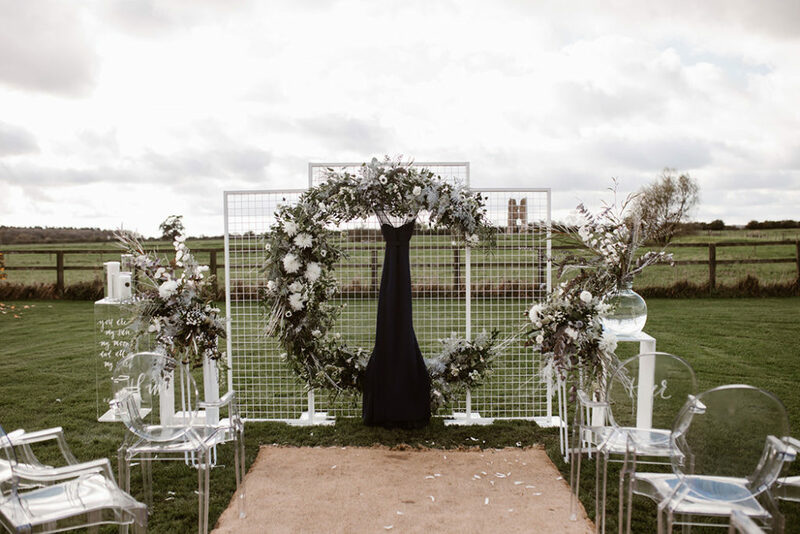 The pallette knifed buttercream outer was worked with inky blues, charcoal and jet black, neutral buttercream and white flashes. 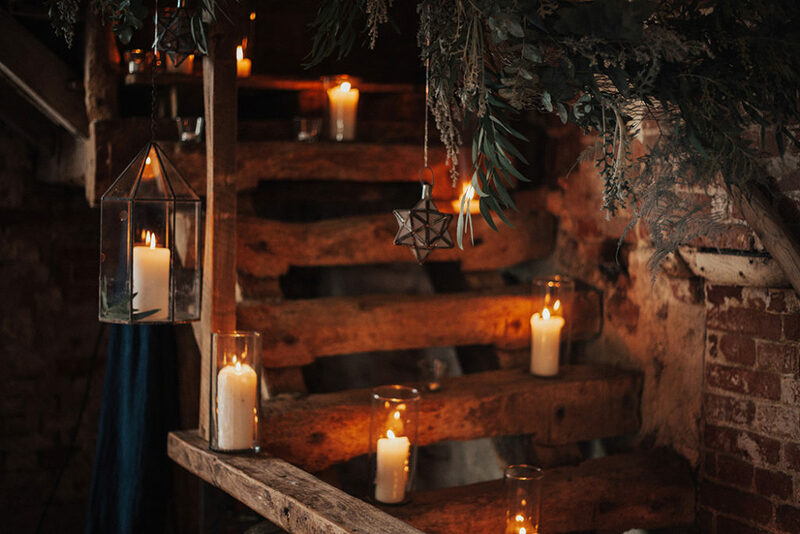 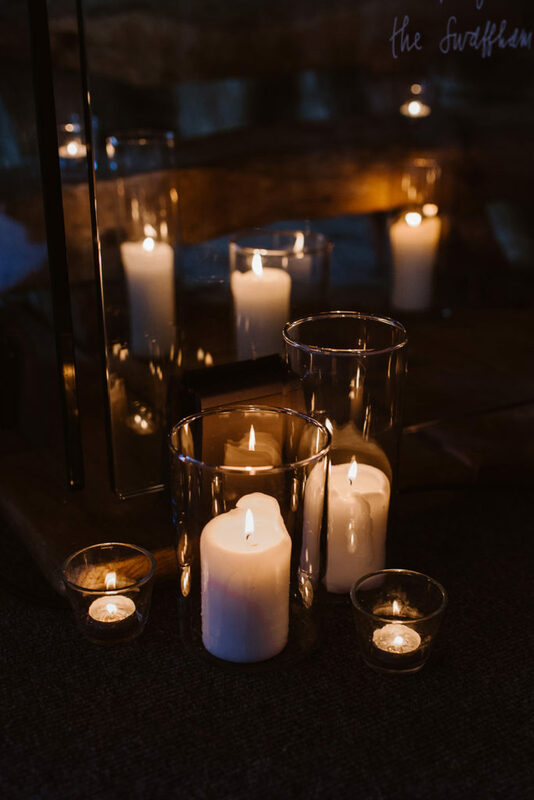 Lit by timbered nightfall and Scandinavian tapered candles provided soft lighting over the textured exterior. 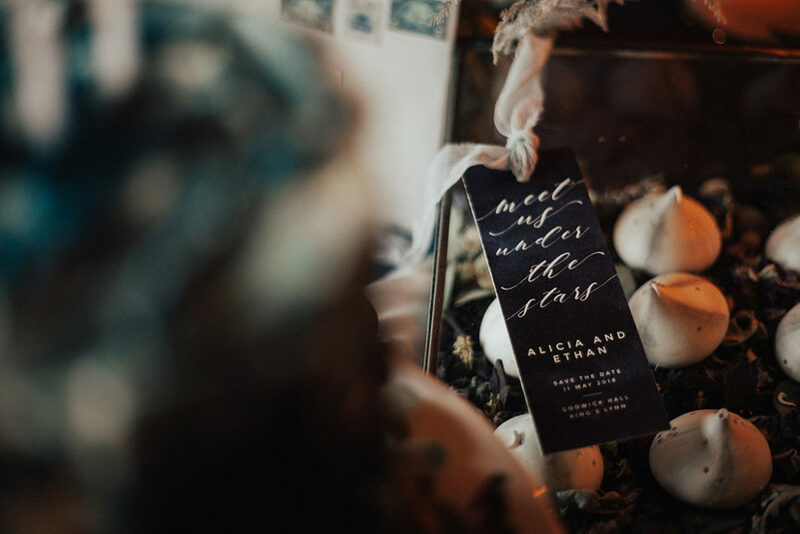 A glass display box laid with a winter mix of dried confetti from Norfolk Petal Confetti with sweet swirled meringues by Dust with Cocoa. 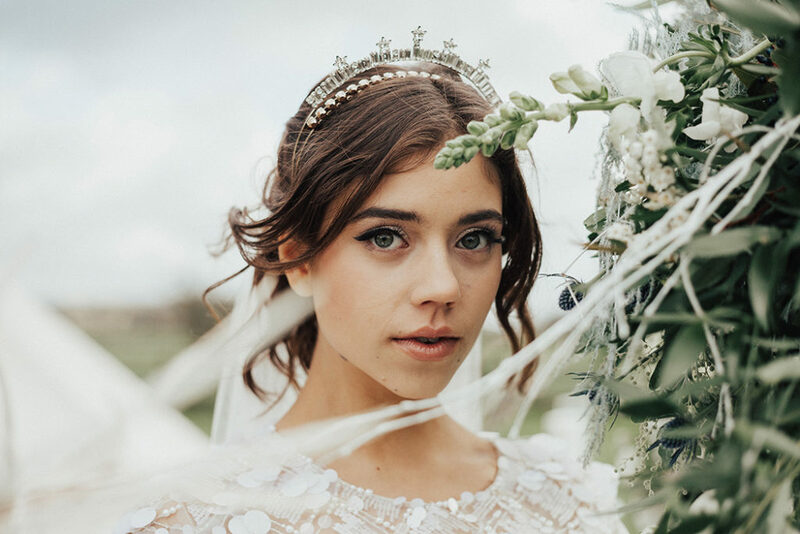 With thanks to Model Lily.